And Lord Ganesha comes today, amidst the roar of the drums and the chime of the cymbals, with dancing gaiety and shouting. He comes to innumerable street corners of the cities in varying shapes and sizes, in different colours and makes. He is grand, he is sweet, he is talk and rotund. He will be a special guest of the city for the next 10 days or so, at various street corners, in homes across. And then after 10 odd days, he will make a much grander exit. In these days, there will be millions of prayers that will need to be fulfilled, so many to take care and forgive. So many sad and desolate to console, so many nervous and edgy to be comfort. 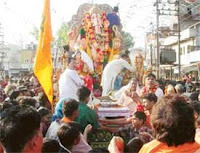 Any other celestial in his pace would have been daunted by the task at hand, but not so our portly lord Ganesha, who has been coming to the city again and again for quite some years, in fact over a century and is quite aware and cued to what happens in and around here. So, without much ado, there is little we can say except welcome of lord Ganapati or as they say it here, Ganapati Bappa Morya….